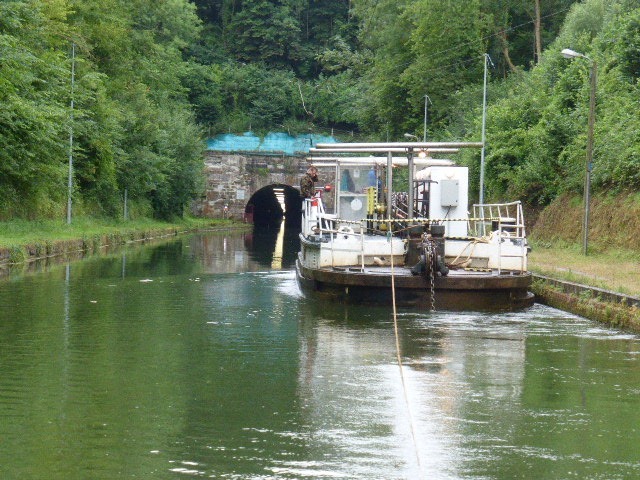 The tunnel is 5,670 metres long and an electric chain barge is attached to the first boat; subsequent boats are tied together and all pulled through in a ‘train’. There are only 2 trips in each direction per day, starting from the South (the other side to us). It takes about 2 hours plus tying/untying time. Saturday 11th we trundled on towards the summit and the tunnel, knowing that we had 1 more day’s cruising to reach it. At lock 9, a manned control lock, G was asked when we wanted to travel through the tunnel. The only choices were 9.00 am or 5 pm – with no time to think about it he booked 5 pm Monday. We stopped at Tordoir that night and I didn’t want to move on on Sunday in case we didn’t have a TV signal in the cut close to the tunnel as I was heavily into the tennis. I cajoled G into cycling back to re-book the tunnel for 9 am on the Tuesday. When we left on Monday morning it was peeing with rain and we steamed in full wets. 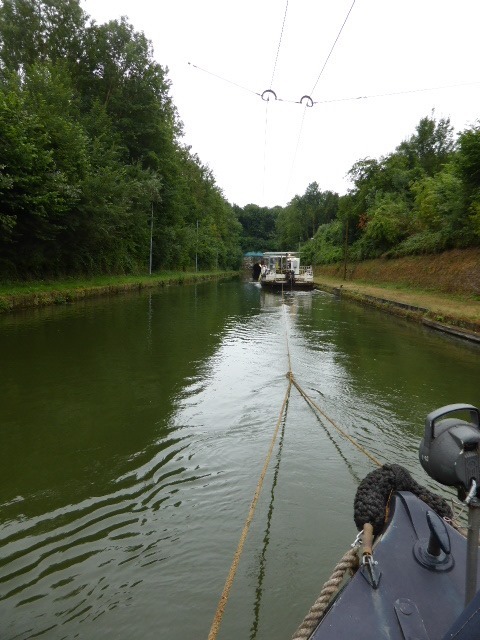 Fed up, we moored at Honnecourt, 3 locks short of the tunnel. 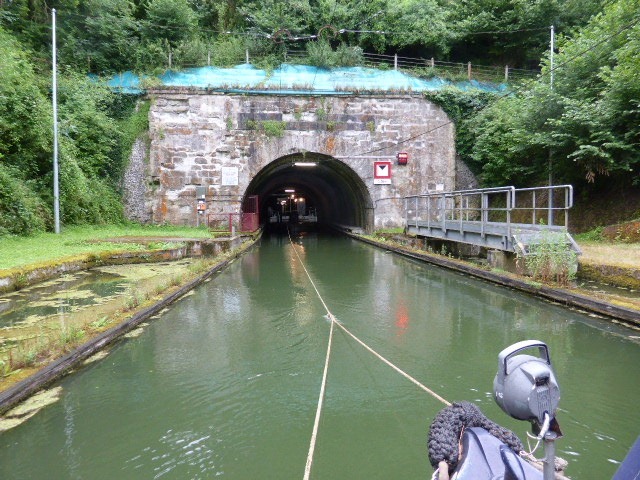 I’d mentioned on FB that we were going through the tunnel in the morning and someone pointed out that Tuesday was the 14th (Bastille Day) so we were very unlikely to be going anywhere – like most boaters I had been totally unaware of the date. Yet again my intrepid cyclist set off for lock 9 – further away now – to check out the validity of our Bastille Day booking. 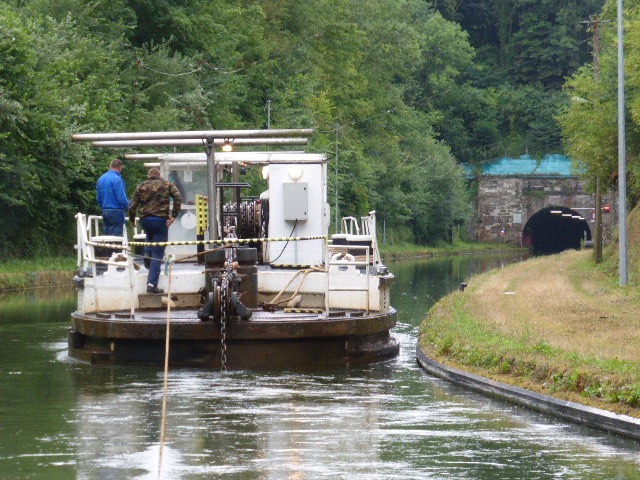 The lockie confirmed that the tunnel and locks, of course, were not going to be open (clearly the lockie that took the booking in the first place had no more idea of the date than we had!) so he re-booked for 9 am Wednesday only to be told that we had to be at the muster point at 8 am. It was going to be tight as we had 3 locks and 5.5 km to run and the locks won’t operate until 7 am when a man in a van comes and turns each one on individually. We were up at 5.45 (gasp!) and hovering outside the first lock at 6.55. We arrived at the red light/muster point by the entrance to the tunnel at 7.58 and waited. And waited, and waited, and waited. 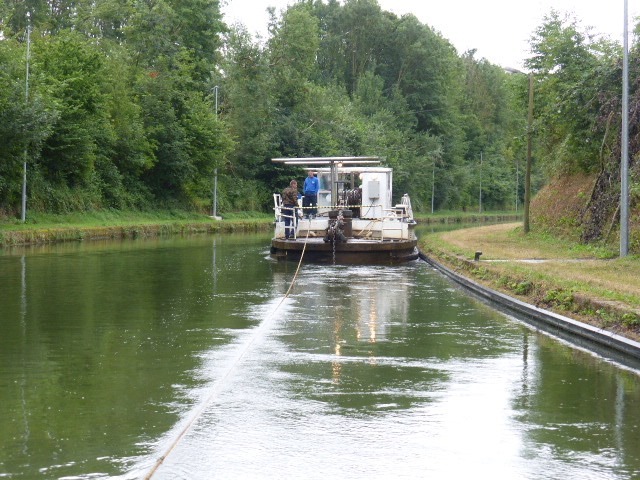 At 9.20 we phoned the controller at lock 9 who responded with, “no, no, no – 1700 hours” (only in French). We protested but met with a brick wall – I was a long way from being a happy bunny. We were the only boat waiting to go North/South and we could only deduce that no boats wanted to come South/North so they wouldn’t come through ‘empty’ just for us. Trying to make the best of what was going to be a long day – we now had no chance of mooring on the South side until at least 8 pm – I started to put together a cooked breakfast when I heard the sound of a small engine. 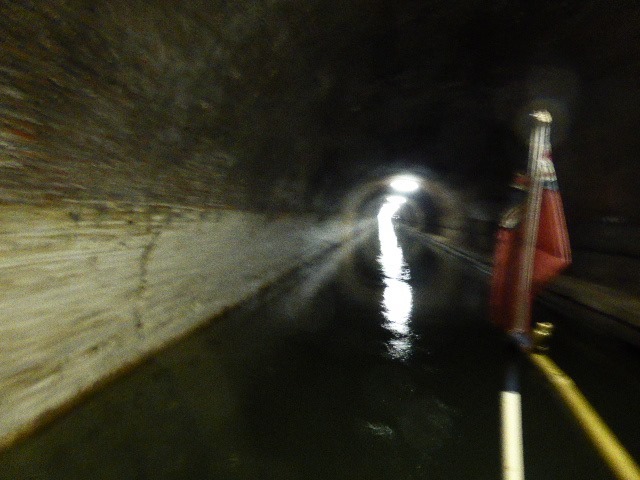 It was a little sailboat with an out board which had just come through the tunnel. There in front of us and throwing ropes in our direction was the chain barge – it was 9.40 and we were off! As we were the only boat in tow we made good time and were through and untied in just under the 2 hours. 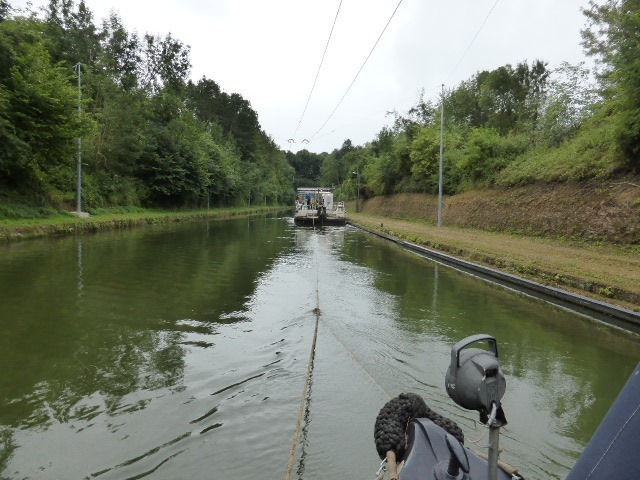 The guys on the barge were off for their obligatory lunch before their final out and return starting at 2.30/3.00. The guy in the so-called ‘control’ lock clearly hadn’t the faintest idea what was going on and, as is normal over here, there seemed to be absolutely no communication. 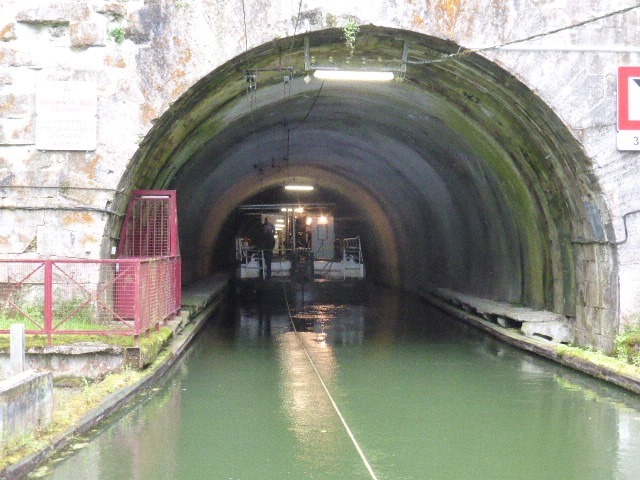 After 7 km there is a 2nd tunnel – Lesdins, a mere baby at 1,098 metres long. No problem with this one as we were allowed through under our own steam. We moored quite early at Lesdins village for lunch and an afternoon snooze. This entry was posted on 26/07/2015 at 4:35 pm	and is filed under Uncategorized. You can follow any responses to this entry through the RSS 2.0 feed. You can leave a response, or trackback from your own site. or three… why an electrically operated chain tow barge? what reason is there for not travelling under your own power? would it just be for the lack of ventilation perhaps? This used to be the main link between the channel ports and the Seine until the Canal du Nord was opened in 1965. 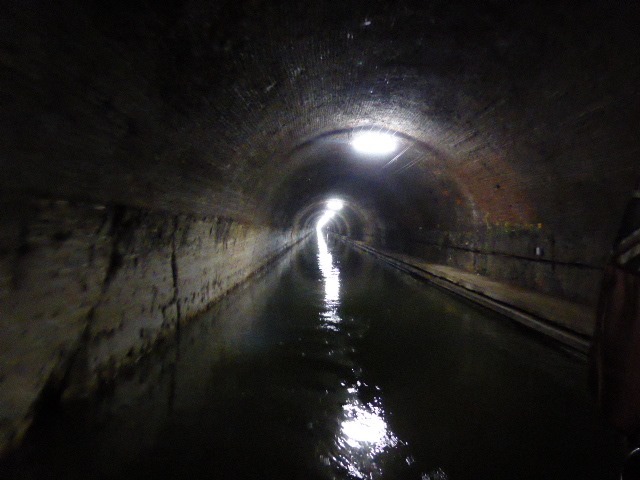 As such, this one-way tunnel (without passing places) carried all the heavy tonnage. As you quite rightly say, the ventilation isn’t up to it and they couldn’t risk a breakdown. Why do they still do it? I don’t know – jobs for the boys/unions? Great to read you again! I tried to read your blog from the beginning but there is still a part missing in the middle 😔 I still didn’t read. But I am still happy that you are writing…it connects me all the year to the water ways in France. I really admired you for staying on the boat all the winter and surviving! Often not simple I imagine…. Congratulation to the new fridge and successfully passing the tunnel…. Finally we are back on the water too – maybe the last time with a hired boat, because next year we will hopefully leave with our own one! This time it is the tour with “La Petite Pierre”, the first houseboat we ever tried about eleven years ago. Now we are in Sarralbe near Sarreguemines and the German border. A day just to relax and enjoying doing nothing 😎 , because there is lots of wind and we have decided to stay here til tomorrow. Doro is writing our board-book and I am meditating about the possibility to start writing a blog – would you recommend it?…..
And what about the wind in your region??? Is it as strong as here in Elsaß-Lothringen? Hi Anja, lovely to hear from you again. The winter here was no problem; we were only iced in for 3 or 4 days so far easier than winters in the UK. Great to see that you’re back on the water and have started to blog – not only is it a great record for your own memories, but it makes for many new friendships too.